Brian Newby has extensive experience representing Fortune 500 companies, national insurance carriers, retail distributors, small businesses and political subdivisions, including school districts, water and transportation authorities in commercial litigation, administrative law and governmental affairs. In addition, he has served in numerous local, state and national leadership positons, including elected office, active duty and the Air Reserve Components of the United States Air Force. He currently holds the rank of Major General. Brian Newby heads our Public/Regulatory practice. He has extensive experience in commercial litigation as well as regulatory matters. With over 30 years of courtroom and state administrative law experience, he specializes in assisting clients in resolving high-profile, complex issues. He counsels large and small businesses, as well as state and local governmental entities, on a wide variety of administrative law and legislative initiatives impacting their day to day business operations. His client base includes leaders in the fields of education, water, transportation and health care. A courtroom advocate, Mr. Newby has taken to trial, arbitration and mediation hundreds of cases involving commercial business disputes, construction defects, public and private contract claims, personal injury and employment agreements. In addition, his practice includes representing clients before state and federal administrative hearing boards. A seasoned litigator, he has tried cases in state and federal courts throughout the state of Texas. Experienced in state and local government, Mr. Newby served as the Chief of Staff and as the General Counsel to the Governor of Texas. He co-chaired the State of Texas’ hurricane recovery efforts following Hurricane Ike. He also has an extensive background in conducting independent investigations of sexual assault, sexual harassment, professional responsibility, violation of management standards/polices and violations of national, state and local codes of professional conduct. 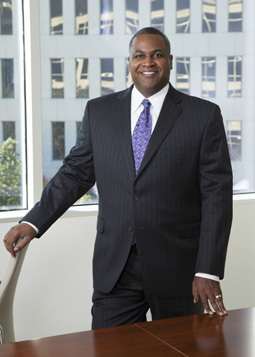 For a number of years, Mr. Newby served as the outside general counsel to the Houston General Insurance Company. Mr. Newby began his legal career as an Air Forces lawyer (JAG), where he served as a felony courts-martial prosecutor, a defense attorney and conducted numerous commander directed investigations. Following active duty, he joined Cantey Hanger where he has been a partner in both the Fort Worth and Austin offices. He now holds the position of Counsel in the Fort Worth office. He was named to Extraordinary Minorities in Texas Law (2010) by Texas Lawyer Magazine and to Power Attorneys (2012) by Fort Worth Business Press. A committed military officer and proven leader, he currently manages over 450 military lawyers and paralegals nationwide in a reserve component of the U.S. Air Force. He holds the rank of Major General and is the highest ranking African American military attorney in the United States.